Surviving members of the Lucas Aerospace Combine are supporting the New Lucas Plan project, and were present at the 40th anniversary conference in 2016. The Combine members are also supporting, and appear in, The Plan by Steve Sprung. The Combine archive is being digitised and will shortly be available on the May Day Rooms archive website. To contact members of the Combine, email info@breakingtheframe.org.uk. Lucas Aerospace, as part of the Lucas industry Group was a major manufacturer of aerospace components. It employed 11,000 highly skilled manual and staff workers on its 17 sites. The workforce had a strong and effective trade union representation involving 12 different manual and staff trade unions. However, because Lucas Aerospace management made corporate decisions centrally, the shop stewards realised that the trade union structure that existed made it difficult for the workforce, through its elected representatives to respond in a coherent manner. So the democratically elected senior stewards of both manual and staff unions from all the Lucas Aerospace sites combined and formed a committee which was representative of the entire workforce. 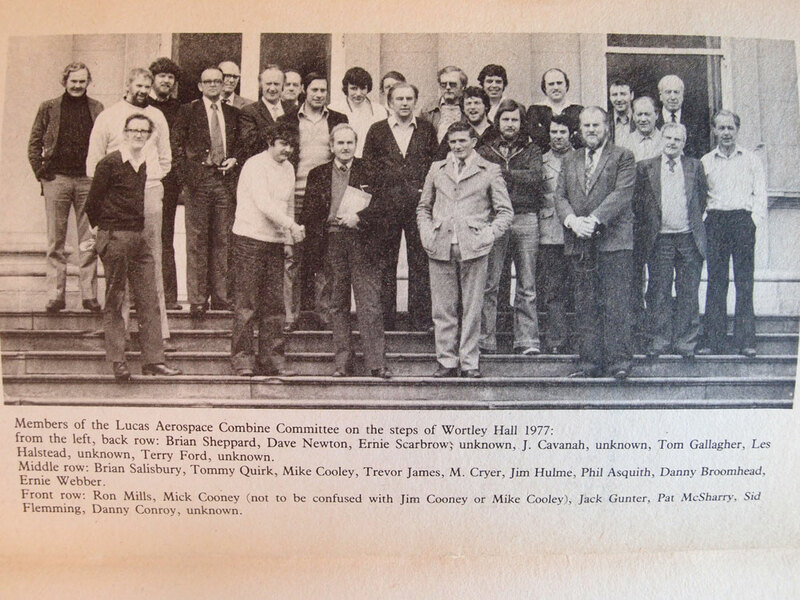 The Lucas Aerospace Combine Shop Stewards Committee was an addition to the existing trade union structure, ensuring that individual unions retained their own autonomy and negotiating rights. Liaison or joint shop committees also operated on most sites, again dealing with issues of a common nature. The Combine met on a regular basis with any recommendations reached being reported back to the individual sites for decisions to be reached democratically. Between meetings, liaison took place between sites by telephone. Information was shared between them and when necessary support was given to individual sites. The Combine was effective in preventing management playing one site off against another. Although not a negotiating body, the Combine through information sharing, providing support when necessary. It proved to be an effective trade union body and a thorn in the side of management. In its strategy development role, the Combine enabled individual craft unions to negotiate from a position of strength. As the Combine’s influence grew it played a major role in improving both workers’ and staff pensions, drawing on the knowledge of individuals within the workforce who, although not employed in the pension field, had a natural expertise, which they provided voluntarily to aid the workforce. For more details of the formation of the Combine and the politics surrounding it, we recommend Hilary Wainwright and Dave Elliott’s book The Lucas Plan. In the early 1970’s the aerospace Industry nationally was being restructured, actively encouraged by Government, and the Combine could see that Lucas Aerospace would be affected. During a meeting with Tony Benn, the Government’s Secretary of State for Industry, the Combine was encouraged to develop an alternative strategy for the company. When the Combine next met they decided to draw up an Alternative Corporate Plan with the full involvement of the Lucas Aerospace workforce. For more details of the story of the development of the Alternative Plan, see the Story of the Lucas Plan page.